You probably have learned in Science grade school about having four basic tastes, two or more decades ago. Remember the "tongue map" which showed the classic taste regions in our palate? Did you know that the common misconception about taste - about the “tongue map” which illustrates the differences in sensitivity across the human tongue for the basic tastes, has already been dispelled? To recap, we knew about the four tastes, sweet, salty, sour and bitter, fact is, according to scientists, there is a fifth taste, and let me reiterate it's not spicy! Bet you didn't know that, did you? Technically speaking, we don't actually taste the spiciness in spicy food! Haha! Spiciness, according to a certain research I've read online is in fact a form of PAIN sensation! Surprised? When we eat spicy food, what we get is basically a combination of the pain and burning sensation our tongue gets, and that my friend is what you call spicy. So you might ask, what then is this fifth taste. Take a good bite into that roast beef, savor it. Is there a tingling flavor in your mouth, is it sweet, salty, sour, or bitter? If your roast beef haven't been smothered in barbecue sauce or drenched in marinade, that savory flavor may not be quite like any of the four traditional tastes that we knew. That "deliciousness" energizing our taste buds is the umami, the fifth taste. Before I go deeper into the scientific matters regarding this, which I won't, since I'm just blogging for the enjoyment of all these God-given tastes, I'm sharing how I got re-acquainted to this intriguing fifth taste a couple of days ago when I visited Tama Yaki's sister food-establishment, The 5th Taste, a fitting moniker! 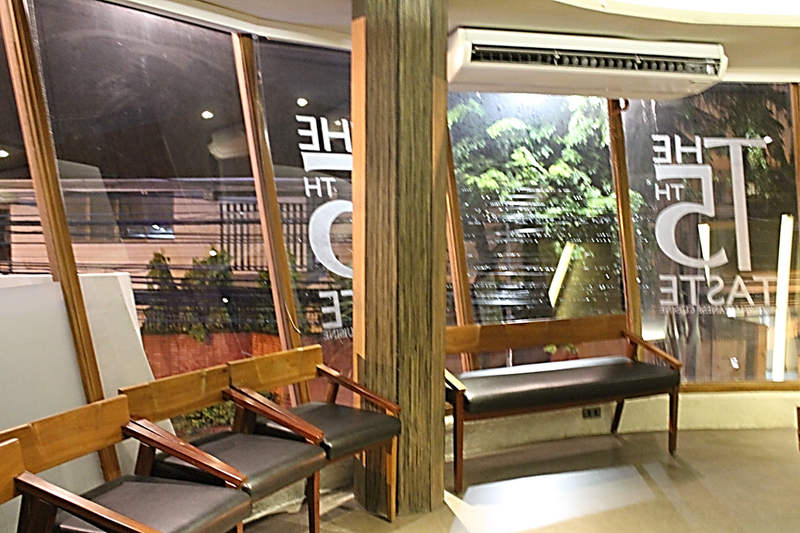 Located on top of Tamayaki along Guevarra St., quite near Cafe Isabel, its a new haven for Japanese fusion dishes. 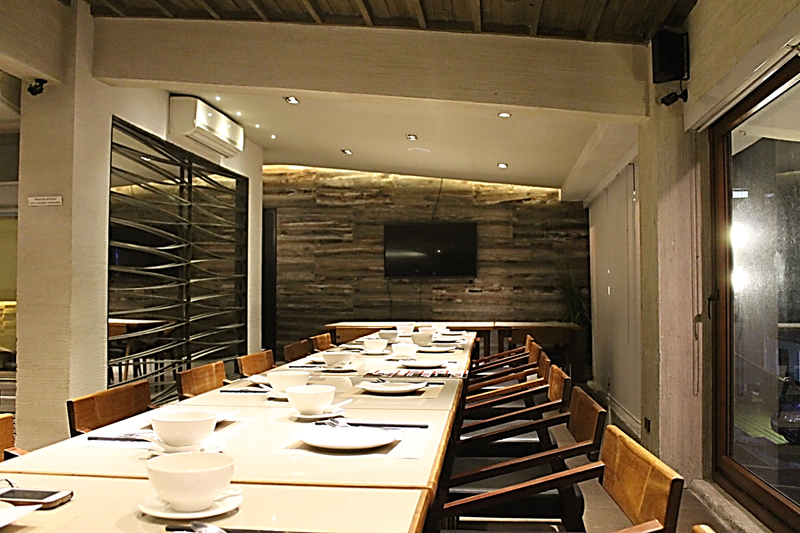 The ambiance of the second floor blends in so well with their modern and innovative take on our classic Japanese favorite dishes. 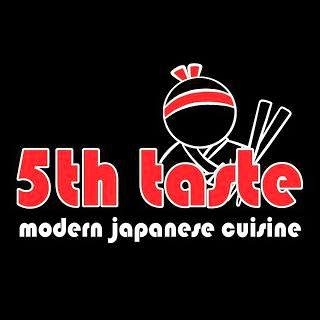 The place isn't at all intimidating, 5th Taste, being a casual, laid back restaurant made sure that what you're getting is serious "umami" taste. However, the building where Tamayaki and 5th Taste is, is such a good example of modern Japanese architecture. On a tea pot, the miso broth, piping hot and delicately seasoned is served with all the unique trimmings in a cup. This is not your typical commercial miso on a sachet type, everything is made from scratch and this one is not an exception. What makes this special is the addition of pork floss laid on the cup together with a tofu and some slices of scallions. It's a love at first sip, I tell you! The pork floss really leveled it up from its classic flavor. Anyone who has a craving for California Maki? Bet you didn't had one fried yet, have you? Yup, you heard it right! These beautifully sliced makis were rolled on crushed panko and fried. Different flavors melded as you bite the whole maki (yes no matter how a petite eater you are, the proper way to eat it is to dump it whole in your mouth), with two kinds of sauce readily available on its plate- mayo and teriyaki sauce. It’s time to make an unassuming dish the star that it deserves to be, meet Tofu Steak ( P155 ). During this dinner, five of the seven food bloggers invited chose this as their favorite, including me. Why? Probably because of it being a light in-betweener or appetizer, yet it's flavorful and comforting at the same time. 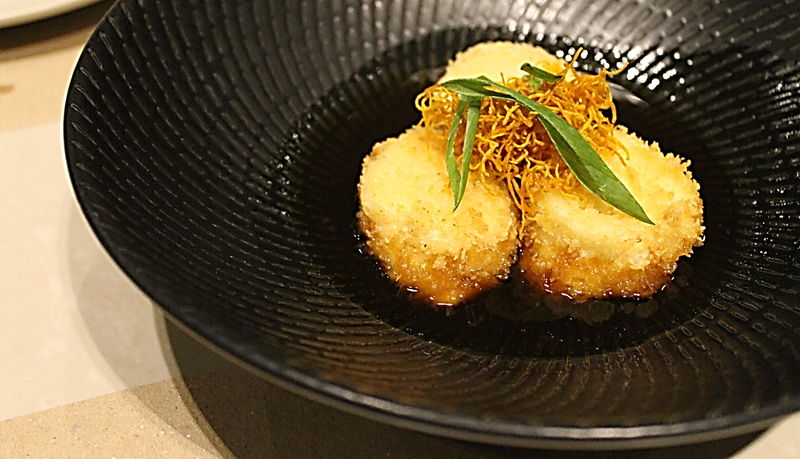 First, the silken tofu is faintly breaded and fried, served on a bowl with a reduction of honey and shoyu, shoyu being an essential ingredient in Japanese cooking, makes this truly Japanese and to make it extra special, crisped kabocha pulp was topped. Kabocha is a Japanese type of pumpkin, a cousin of winter pumpkin and might I say I was surprised they even had made a use for it's innards sans the seeds, and the outcome was just so amazingly delish. You may also want to take note of 5th Taste's Roasted Kabocha soup, which I'll be coming back for. If you are keenly aware of some salad pizza then you'd like this for sure, though it's not the complex type. 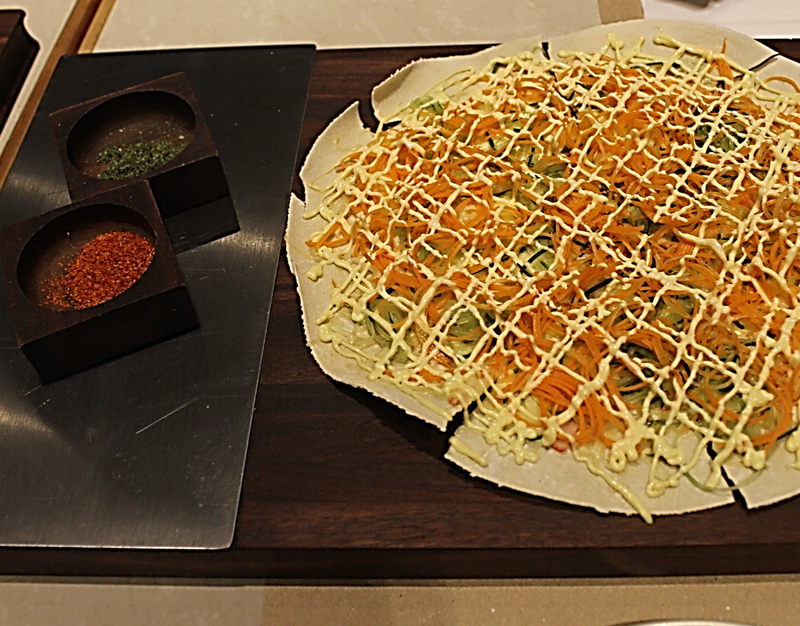 A home-made thinnest of thin crust pizza, the Kani Salad Pizza (P 285) resembles a lavash flatbread but topped with shredded kani, cucumber-carrot ribbons, mozzarella and Japanese mayo. Stimulate your senses more by dashing some powdered nori or chili. If I'm in to sprinkling a heap of powdered malunggay on some of the dishes I cook, they lavishly use powdered nori to garnish, as in the case of their version of Lasagna. I like restaurants who thinks of their customers to even make something out of the box. Making this place a one-stop place for a modern Japanese dining with some usual restaurant faves. 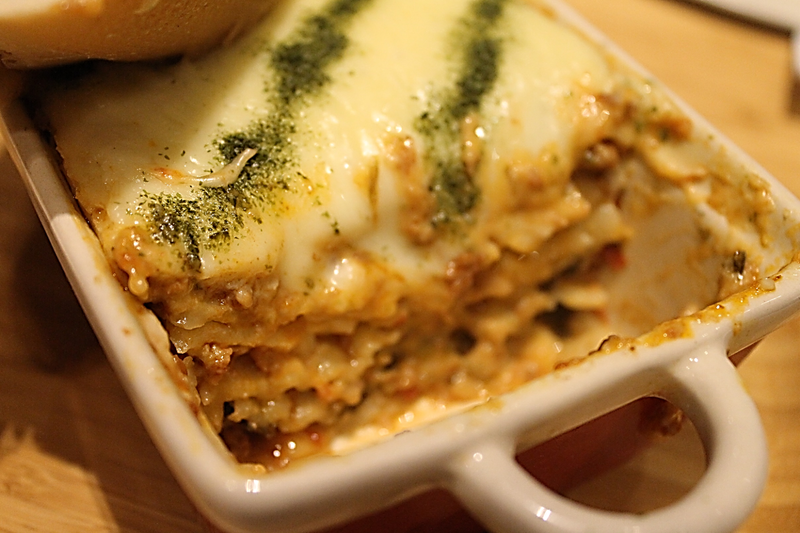 So consider Cheesy Madness 5th taste Lasagna (P 285), another favorite of mine, and I'm sure my kids would also love. Aside from the powedered nori topping over creamy mozzarella, what made this a fusion is the Teriyaki Bechamel sauce made to flavor this Italian staple. 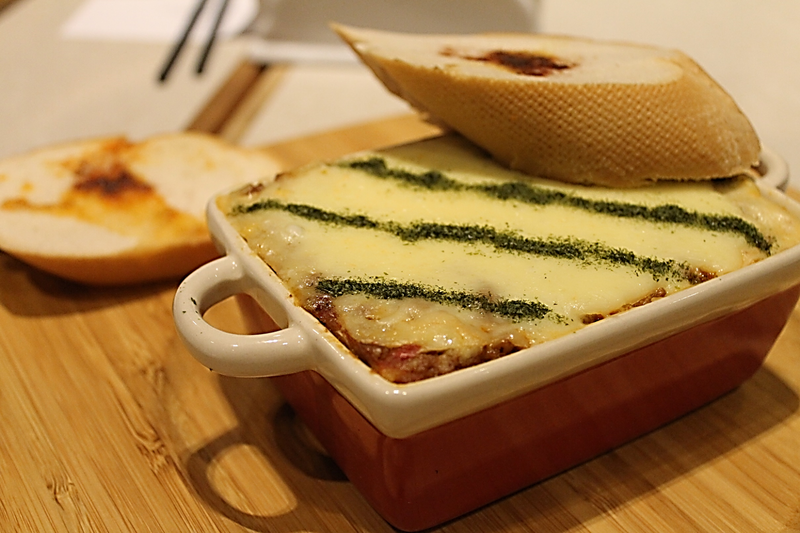 Oh also how can I forget their utterly unique display of unifying ingredients, would you ever consider putting or having nori sheets in between the layers of lasagna pasta, bolognese sauce and cheese? Yep they did! I thought it was a clever idea. 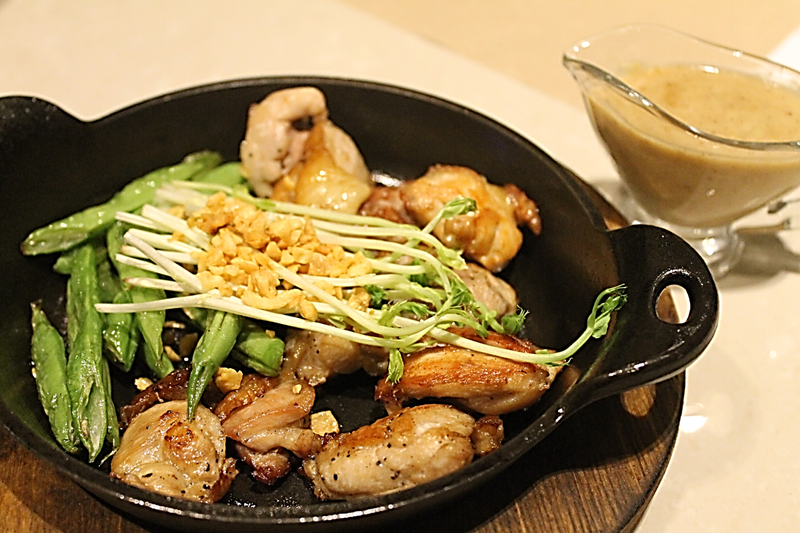 We also tried two mains, Mirin Chicken Ala Pobre (P 190) and Japanese Cream Cheese Onion Tonkatsu (P 385). Chicken ala Pobre. Nothing is so pitiful in this dish, though the Spanish called it so, where "pobre" would mean "poor," this dish is so rich in garlicky flavor and saltiness, that is. Simple as it is, there is nothing more that can be done to transform this except by adding such vegetable varieties. Geez! It's just so amazing that young and dedicated chefs would come up with such ideas and apt up certain boring dishes, say for example Chicken ala Pobre. Simple and streamlined, the addition of Mirin Sauce or Japanese cooking wine tickled my distinct palate for that umami that's needing some kick. If you prefer pork, then you probably are into tonkatsu, thus, you're in for a treat, for you'll find their version a bit more interesting. If plating alone won't wow you over then go ahead and just have your first bite. Look at how they have managed to put height into the plating, but it serves a function. Sure they want to veer away from how Yabu and other similar restaurants would serve it on a mini wire rack. Apparently, the owners don't want the oils dripping all over their diners' table or wooden board which they serve it with, so they had it set on a glass dish with wire on top. Though I didn't find any oil drippings, hehe, which is better. I never liked any oily breaded meat. If you think this is your usual tonkatsu, well you better try it, and with your bite, you will find the difference. Okay, okay, I'll tell you. You see, hidden beneath the breading are caramelized onions and cream cheese. This is also served with Japanese slaw and special tonkatsu sauce, and you don't need to work it out. Dessert is Sans Rival ala 5th Taste. Nothing special here really, which got me a little disappointed. But when I got to try it, it was all worth every waiting and anticipating for. 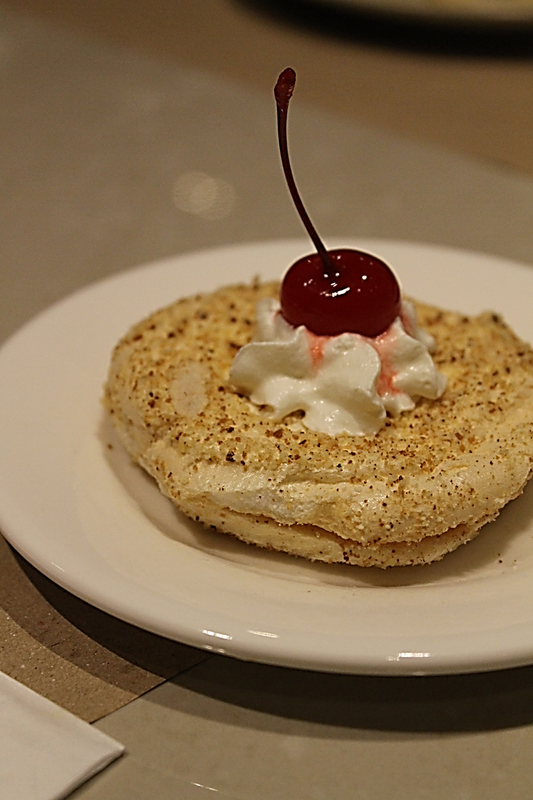 If you have tried Beard Papa's Sans Rival then you'll know that dessert is fascinating, it's the same thing actually. Nothing have kept me from trying this restaurant out, not even heavy traffic and rains, it was such a nice feeling having to try another restaurant joining my "great list" and having it with such a nice crowd of bloggers. Address: 453 P. Guevarra St.
uggs bailey button sale Een uggs bailey button sale van de mensen niet weten waarom gewoon niet bang voor de dood als twee krijgers in uggs bailey button sale slachtafval hoe plotseling begon ugg classic short sale geklemd zijn hoofd roll. Zie hem schreeuwen luid en gek te rollen waren geschokt. Alleen weten dat de verkoop op zijn gezicht gedoofd sigarettenpeuken, is uggs bailey uggs sale nederland button sale dit maakt ook diepe verdriet. Ten tweede, een aantal andere mensen zagen het.